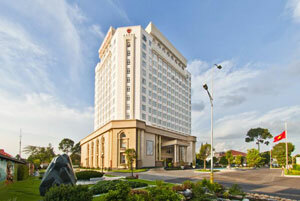 As a built International 5-star standard hotel, Tan Son Nhat Saigon is situated near the airport and next to the main route to the city center; with easy access to exhibition center as well as many shopping and entertainment areas. The only hotel has a rooftop helipad to ensure privacy of access for VIP's and businessperson. Our meeting rooms are designed to accommodate all style of meetings, conferences and exhibitions with capacity for 40 to 200 guests. The latest technological equipment is available on request.